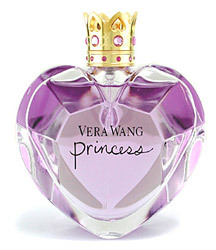 Vera Wang Princess is a wildly popular girly fragrance released in 2006 and marketed toward women in my age bracket, the late teens to mid-twenties girl. It seems those of us in this bracket are wild about fruity, floral, candy scents because Princess is all of those things lumped into one big, purple package. In Bottle: Fruity top notes blended with clean girly florals. Very sweet, very feminine, and extremely young and lighthearted scent. There’s something a bit musky about it too. Applied: Princess is a weird mix of foody floral peppiness and clean musk. It’s trying to go two ways and I’m not really sure that’s working out for it. However, what Princess does get right is a pleasant, sweet light floral swirling in pretty chocolate cake batter being mixed in the shower. The musk in this prevents Princess from being an all out gourmand. Dark chocolate mixes very well, I have to admit and this is coming from someone who thinks most chocolate notes smell terrible. The dark chocolate present in Princess is a rich, cakey note that is often one of the first notes to fade on me. Eventually, all I’m left with is sweet and clean musk. This is pretty much what a Disney Princess would smell like. Extra: Seems like I’m on a sweet and floral binge lately with my fragrances. Princess is one of those scents that, for some reason, goes straight up my nose and blinds my sense of smell after a while. I smell this on everyone though, as its popularity means every young woman in and around my age is rocking the purple heart. Design: Bottled in a big glass heart, Vera Wang Princess is an appealing look for–well, anyone younger than me who likes that kind of thing. I find the bottle to be garish and a bit tacky. Cute, yeah, but it’s a big purple heart. You can also pop the cap off and wear it as a ring. The design is just a little too young for me, I think. Or maybe they just completely missed me when they designed this bottle because everyone else seems to love it. Jeez, look at that notes list. It’s pretty much like a recipe for some of the craziest cupcakes ever. Reviewed in This Post: Princess, 2010, Eau de Toilette. This entry was posted in floral, Reviews By House, sweet, vera wang and tagged cake, candy, chocolate, cupcake, floral, fragrance, perfume, princess, scent, sweet, vera wang. Bookmark the permalink.